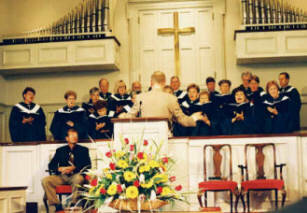 The Sanctuary Choir meets on Wednesdays at 6:30 p.m. for rehearsal and leads in musical worship at 10:55 am each Sunday. They also present seasonal musicals. The Sunday Night Choir meets at 5:30 pm most Sunday nights and sings during our evening worship service. The Student C hoir (grades 6-12) meets at 5:00 pm on Sundays during the school year and sings during worship services and within our community. They also participate in Youth Choir Festivals and a Choir Tour in the spring. The Praise Ringers are a five octave handbell choir that meets from August through May on Wednesdays at 5:00 pm for rehearsals. They ring during our morning worship services throughout the year. The Celebration Ringers are a six member handbell ensemble that ring at various venues in our community throughout the year. The Brass Ensemble rehearses on Wednesdays at 7:30 pm and plays during our morning worship services and within our community throughout the year. The Praise Team leads in musical worship most Sunday nights and some Sunday mornings. They rehearse on Sunday afternoons. The Women of Faith is an ensemble of ladies also sponsored by our Women's Ministry. They sing for both morning and evening worship services at various time throughout the year.